Even though Second Life does not run our own rescue (we leave that to the groups who already know what they are doing), we have done personal rescue of dogs from the ESMA (Egyptian Society for the Mercy of Animals) shelter in Cairo, Egypt. We have family in Egypt, and when we visit them, we always visit the shelter as they have over 1,100 dogs and cats and rely on help from abroad. The shelters and rescuers give their hearts and lives to making a difference with little support or cultural approval. They rely on help from abroad to give these amazing animals a chance at being loved, and we are happy to help when we can. We believe rescue knows no boundaries. If we can help an animal in need, we will, no matter where they were born. Their lives matter just as much as the lives of those dogs and cats lucky enough to be born in a culture that adores pets. 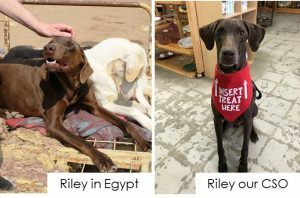 Riley: Our Chief Smile Officer was found in a Cairo pet shop in a severely emaciated state. ESMA rescued him and brought him to the shelter, where he was depressed, as he had lived in a home previously and knew what he was missing. We brought him back to the US in March, 2012 and we had just planned to foster him…but he had other plans. We adopted him in May, 2012 and he became our 2nd Chief Smile Officer, bringing joy to everyone in our store. He went from sleeping on a metal bed frame at the shelter to under the covers in our bed. Rescue is all about second chances! You can read more about him on our Chief Smile Officers page. was adopted in October, 2014 by one of our customers and we are so excited our sweet boy has a forever home! He and Riley are now best buddies and they get to play often. He is top dog and is spoiled every day by his new mom and dad. 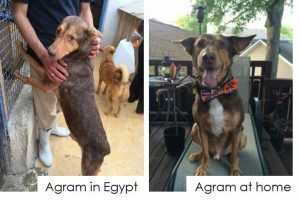 From Cairo, Egypt to a loving home…this is what second chances are all about! Angel This sweet black & tan shepherd mix was hit by a truck on the Cairo streets and her back-end was critically injured. ESMA did not give up on her and sought treatment and surgical options for her back legs. Unfortunately, one of her back legs did not heal properly and she lived for 4 years at the shelter with her deformed leg sticking up in the air. After seeing her at the shelter for the third time in 3 years, we knew we could not leave her again. We raised money for her to have her damaged leg amputated (although amazingly, an anonymous donor paid for her entire surgery). Within a month of arriving in Atlanta, she was adopted by a Second Life volunteer in November, 2012 – and is now a registered therapy dog bringing joy to those who need her smiles the most. We have no idea how she survived the extent of her injuries. Even through all she has been through, Angel is one of the happiest and sweetest dogs we have ever met. She visits Second Life weekly and brings joy to everyone she meets. 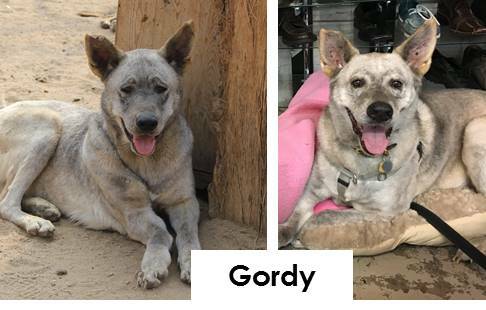 Gordy: He is a big oaf and just a goofy boy. His front leg is damaged due to an earlier trauma, but it doesn’t slow him down. He loves his stuffed toys and has learned to be more trusting of people. He’ s about 10 years old and we think a shepherd/husky mix (we call him an Egyptian Wolfhound). After 16 months in foster care, Gordy was adopted in February, 2014. However, changes in his adopted family’s life meant he came back to us in November, 2014. After trying for another year to find his forever home…we realized he already had. He is now a part of our family and doing great. people suggested that the ESMA team euthanize him, they realized his spirit was too strong. Despite his past, Mazi has a spitfire of a personality. He walked by balancing on his two front legs and even learned to go up and down our stairs. He was a local-celebrity in our store. Our supporters raised money for his wheel cart so he could go on longer walks and act like a normal dog. His big smile in the picture says it all…rescue is all about second chances. He was adopted by a family in Miami in May, 2012 and is now a beach dog with a new leash on life. 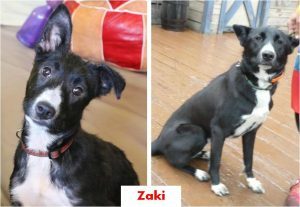 Zaki: Formerly known as Muzo, this little mangey puppy was an 11th hour addition for the transport to Atlanta. He and Mazi were crate buddies and the ESMA founders didn’t want to separate them. So, they shared a crate from Egypt to Atlanta and he became one of the lucky ones. It turned out to be a bit too much to have them be adopted together, so they stayed in separate foster homes and found separate forever homes. Zaki now travels the U.S. with his mom and dad, who are performers in the Barely Balanced show for various Renaissance Festivals. Perhaps one day, he will be a part of their show. Not too bad for a little puppy with severe mange who was saved from the streets of Cairo. Haboob: A silly, loving street dog from Egypt who has been given a second chance at life! Rescued off the streets of Cairo with an injured front paw, it was obvious when we met him at the ESMA Egypt shelter in March, 2016 that he adored people. He couldn’t get enough love and snuggled with anyone who would let him (including me!). After 9 months of being fostered by his PAWS Atlanta foster mom and dad, they knew that they couldn’t let him go…so he found his forever home! A big thank you to ESMA for not giving up on any of these dogs. 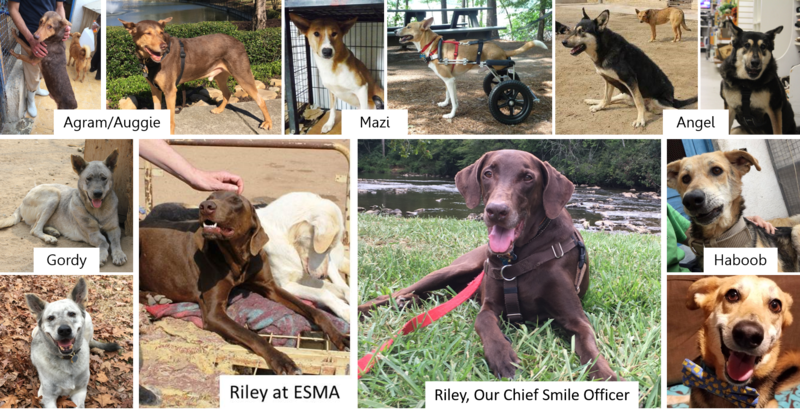 We are also very thankful to Royal Potcake Rescue for helping us with the adoptions of Riley, Angel, Auggie, Gordy, Mazi and Zaki – and to PAWS Atlanta for taking in Haboob. This is what rescue is all about. Giving animals a second chance at life. And in return, they give us unconditional love.